This is a square-shaped, bamboo basket bag. The woven basketwork is lacquered in 24-carat gold, with a flat band around the rim. 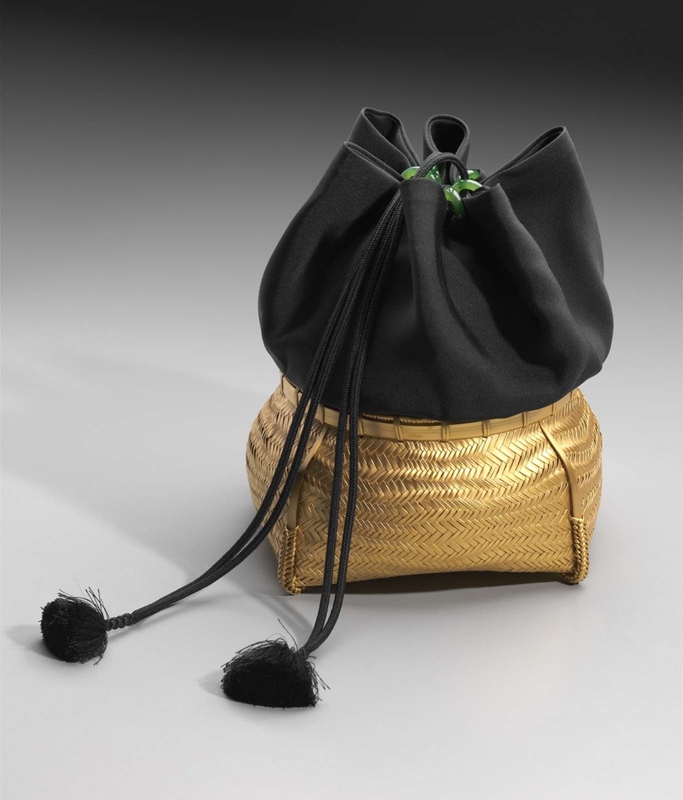 Black silk panels are attached to the top of the basket forming an expanding lid with drawstring closure, while the black silk cord is threaded on six green jade rings that ends in tassels. Made in Japan for Tiffany & Co. The basketmaker, Watanabe (born 1932), is a distinguished Japanese bamboo artist with a considerable reputation in Japan. His artist’s name, Chikusei, means ‘bamboo purity’.The jade rings were carved by Lily Creation (Lily Wong) in Hong Kong. The gold lacquer was added by Noburo Itsuaki. The assembly of the bags, i.e., the adding of the silk and carved stone elements, was done by the Nakao-so Studio, Kyoto.